It is an appartment on the 1st floor of a just built edifice at a peaceful part of Katapola, 400 metres away from the port of Katapola. Decorated in an attractive way that reminds you of your stay on an island. 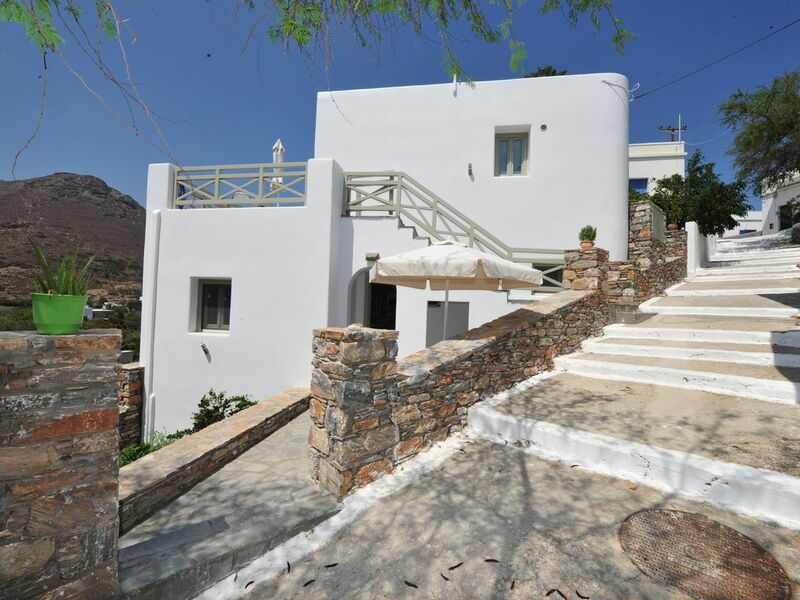 It has got a beautiful view to the mountain of Minoa, as well as to the valley of Katapola. Friendly, warm atmosphere. Appartment of 46 s.m. fully equipped. It can accommodate up to 4 people. One bedroom with a double bed, bathroom, living room with a sofa that is transformed into double bed and a kitchen containing complete equipment (washing machine, refrigerator, cooker, culinary equipment, cookware, bakeware, cutlery, kitchen gadgets, utensils, dinnerware, tableware, glassware, flatware, kitchen towels). We had a really lovely stay in the apartment. John and his family were genuinely keen that we should have a memorable experience. John’s father met us on arrival at the ferry and during our time welcomed us with home made goodies, including savoury and sweet pastries, the local drink, rakimelo, and their own produced eggs and olive oil. The apartment was clean, stylish and well equipped, including a washing machine. On a couple of occasions, we used the oven, pleased to have the option of eating a cooked meal at home. We enjoyed the outside balcony, with views over fields and nearby stunning hills and even a glimpse of the sea. Shops and tavernas are delightfully just a short walk (5 minutes?) away. We heartily recommend our most hospitable hosts and their charming apartment! We had a wonderful stay in Amorgos! The property is charming, quiet, new, very clean and had everything we needed. The owners were extremely charming and welcoming. Upon arrival, we found grapes from their gardens, local liqueur, and olive oil, and over the coming days, they brought us other homemade goodies. We can highly recommend staying here. Amazing stay, so peaceful and yet close to town. A very beautiful apartment. Amazing views, great location (6min walk to port), friendly and helpful family that runs the apartment, very clean, fully equipped with top notch appliances and fixtures. We had a great stay and would recommend to anyone. The hosts even took us to the port to catch a 6 am ferry. 6 semaines dans les Cyclades mais 5 jours dans la maison de John et de sa charmante famille est notre sublime coup de cœur! cette maison a tout elle est à la fois spacieuse propre contemporaine au calme belle vue proche des commerces ( une supérette en bas de la rue à 3 mn avec du pain frais )la cuisine est fonctionnelle et très bien équipée, l'accueil à la descente du bateau bien agréable. Que dire de l'accueil chaleureux de cette famille des petites sœurs de John qui chaque soir nous ont apporté de délicieuses spécialités grecques. Nous en avons profité pour partager en anglais un moment avec elles sur leurs activités ( école shopping vie de l'île) Un lieu et des hôtes qu'on n'oublie pas. Maison au calme. Katapola accessible à pied. Tout le confort avec une bonne literie. Vue très agréable sur la montagne. Mais surtout, un accueil chaleureux. Une famille très gentille avec chaque jour des attentions. Un grand merci pour cette petite semaine passée chez vous. L'appartamento è nuovo, dotato di tutti i comfort, pulito, spazioso e a 5min a piedi dal porto. Il soggiorno in questa casetta deliziosa a tre passi del porto è stato impeccabile. Il proprietario, John, un ragazzo educato disponibile e gentile, un po' vecchia maniera, nonostante la giovane età, ci ha fornito tutto il necessario e con cortesia. Ogni giorno ci hanno accolto con assaggi di prodotti locali e deliziose ricette fatte a mano dalla mamma. A chi cercasse la soluzione abitativa migliore x stare ad Amorgos, suggerisco caldamente l'appartamento di John Despoditis.